Home | Blog | Make this year really count; lose weight and get fit. Make this year really count; lose weight and get fit. ‘To lose weight and get fit” are two of the most popular new years resolutions. It seems, however, that only a small proportion of people end up achieving the things that they set out to each year and in the past I wasn’t one of the successful ones. Maybe I just got caught up in the hype, maybe I didn’t really believe I could change or maybe life just bogged me down … kids, bills, jobs, housework… Us mums can’t just drop everything to head to the gym or serve ourselves up a gourmet salad every lunch time. It’s a tricky balancing act ensuring time for ourselves and also making sure that the little people in our life have everything that they need. I’ve been setting new years resolutions to get fit and become more active since I can remember. I’m still working on it but 2011 was the year that I actually ticked off the goals on my list because I had achieved them. It was an amazing feeling, accomplishing things that I never thought possible, all because I got myself into a head space that was all about not giving up, not feeling guilty for taking time for myself and believing that I was worth the effort. And you know what? I was. I’ve never had a weight problem. I became a nutritionist because I love food. I love eating it and cooking it and I’m fascinated by the effect that our diets have on our health and quality of life. I’m by no means a ‘perfect eater’, if there is such a thing, and I’m what they call a fad exerciser. I take up some kind of exercise for a week or two, three if I’m lucky and then I’m over it. I give up or I can’t be bothered any more. Overall, I enjoyed a healthy diet, which regularly contained all of my favourite foods and if I managed to hit the gym once a week, I was generally a happy camper. 9 months after Asha was born, I was attacked by the ‘clucky monster’ and one night of unbridled passion and I was pregnant with Carter (now 21 months) and on the morning sickness train again. The vomiting was just as bad and the Coca-Cola still worked. I was run down after having Asha – I hemorrhaged in my labor with her and lost a lot of blood and for the first 3 months of my second pregnancy I was still breastfeeding her. I was tired. Very tired. One particular day, over 8 months pregnant with Carter, I was lying like a beached whale on the couch. I was miserable. My neck was strained from vomiting so often, my hips hurt, my back ached, my feet were sore and I half gagged on the reflux that kept creeping up my throat. I was watching that Coca-Cola ad on TV with skinny, energetic, perky girls jumping off a giant bottle into the ocean in pretty, bright coloured bikinis… urgghhh! How I envied them. In that moment, I longed for my pre-pregnant body back. A body that I’d taken for granted. A body that functioned well, a body that wasn’t in pain. Now that I wanted to exercise and feed it well, I couldn’t. I made a promise to myself, then and there that when this pregnancy was done I would look after myself like I knew I should. I wanted to feel energetic and strong and not bloated and sluggish. I wanted to feel good about my body because I was taking care of it. 2 weeks later, Carter was born. I felt fantastic. Immediately the vomiting, the heartburn and the panic attacks were gone. I had my precious baby in my arms. Not long after heading home from hospital the promise that I made to myself was in the forefront of my mind. I was determined. After waiting the customary 6 weeks, I headed out the door in my sports clothes and runners for some exercise. I felt inspired, invigorated and excited at my new found motivation. I was ready for the new me. The fit, healthy and confident new me. 30 seconds of jogging felt like an absolute eternity and I was sure I was going to die. What was wrong with me? I was so unfit, I could barely breathe. Devastated, I trudged back home. I was mortified at how far my fitness had slipped and I felt so far away from where I wanted to be that I could have given up then and there. But I didn’t. I had promised myself that I would not take my body for granted again. I thought back to that day on the couch and the Coca-Cola ad and the next day I was out in my runners again and this time I went a tiny bit further. I kept giving it a go. Whenever I could, I’d get out for a walk/jog, whether on my own or with my jogger stroller. I was determined to make exercise a regular part of my life. 12 months after Carter was born I ran my first ever 10km in just over 1 hour and then 8 weeks later I ran a half-marathon in 2 hours and 9 minutes. Yes! I ran, non-stop for 21kms! You can read about it here in my 21km adventure. I never believed that was possible and it felt so good, I’m gonna do it again this year! If you’re feeling a little sluggish, lacking energy, feel like you resemble a couch potato and want to lose weight and get fit, you’re not alone. It’s tough being a mum and still finding the time to get your fitness and your body back, but it is possible. I’m living proof of that. If you’ve given up on your goal to lose weight and get fit after having kids, then I would like to re-kindle that dream back inside your heart. If you want it bad enough you can have it and the hard work will pay dividends in your future. A fit healthy woman is a great wife, friend, worker and mother who not only has the energy to keep up with what life throws at her, she feels good about herself at the same time. Make 2012 your year and achieve the health and fitness goals you’ve always wanted to. You deserve to feel good about yourself! Now go and do! Note from MoM: thanks for another great post Kate – always wonderful to hear from you. 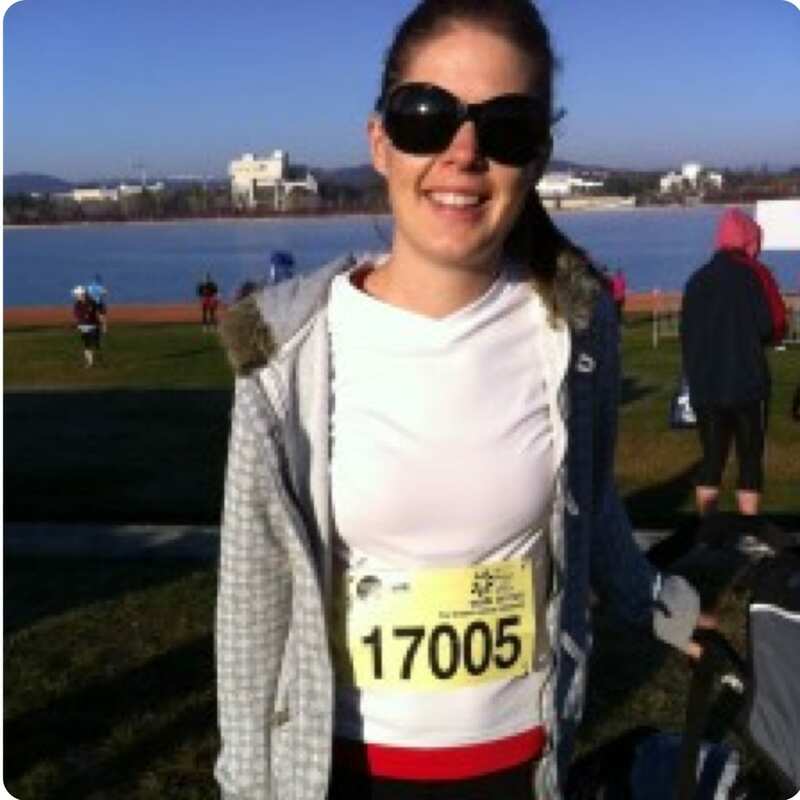 To all the other mums, you must check out Kate’s 21km adventure and the fabulous video she has produced “My heart loves to run” on the same link. I joined weight watchers last year and it kept me more accountable. Thanks for this real article. Making small changes really helps to get big results. A really very interesting article! Thank for this read! I love running but, have recently fallen out of the habit. Thank you, just what I needed to hear. I am a sucker for bad food but always end up feeling bad even guilty for eating it. I need to get my old self back again. Not only for myself but for those around me. Sigh, I always have the best of intentions about eating more healthily and losing weight and getting fit at the start of the year, but life gets in the way of my good intentions, and before I know it, it’s nearly Xmas and I’m still puffing & panting, and several kilos overweight. I need a personal trainer to get me motivated and on track. Thanks for sharing this, I enjoyed reading it. I HAVE to make 2014 my year of getting back into shape!!!!!!! Thank you for this as this what needed to hear life after children.